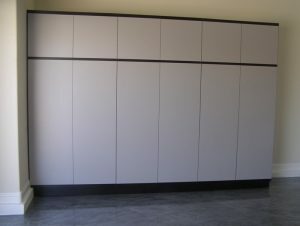 There are five things that you should know before you buy garage cabinets in Phoenix. These things are based on simple, common sense. Let’s start with your budget. Do not buy custom garage cabinets if you can’t afford them. Instead of saving up and waiting until they have the money to get the cabinets they really want, they cut corners and buy something that is NOT the next best thing: the cabinets that they can afford. Is that such a bad thing? It can be. Sometimes, in an attempt to save money, people will settle. Settling doesn’t work in love, it doesn’t bode well for a successful life, and it definitely doesn’t work with garage cabinetry. Installing garage cabinets simply because you can afford them means that in a few years, you’ll be wanting to replace your now beat up, run-down, and most likely duct-taped cabinets with something much more classy. Next, what will you be using your cabinets for, or more precisely, what are you going to put in them? Are you going to need a lot of shelves, or no shelves for larger items such as a kayak or camping gear? Third, what do you want your garage cabinets made of? Are you going to shell out a bit more money for melamine cabinets, or stick with wood or metal. Fifth and finally, are you going to customize them? Are they going to be built in garage cabinets, or are they going to be free standing. If they’re free standing, are they going to be kept in one place, or will you need wheels on them. Remember, the taller the cabinet, the less likely it is you’re going to want to put wheels on it. It will likely be top heavy, and you run the risk of toppling it over onto yourself or someone or something else. Once you have figured out these five things, then it’s time to find the best garage cabinet dealer in Phoenix. Who is the Best Garage Cabinet Installer in Phoenix? Finding the best cabinet contractor in Phoenix is a matter of research, and a a field trip to the garage showroom might be in order as well. How are they when you get there? Do they pressure you to buy, or do they work with you. Do they offer financing? If so, at what terms? So finding the best garage cabinets isn’t as hard as you think. It just takes a bit of research. And getting in touch with a garage cabinet installer in Phoenix.